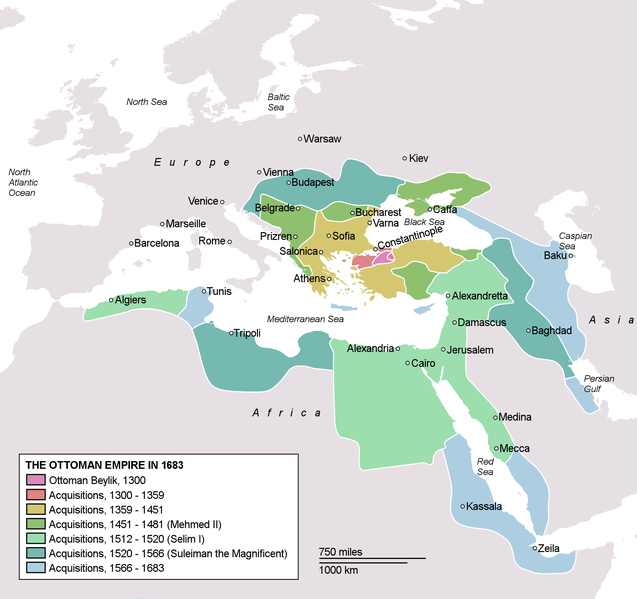 The Ottoman Empire preceded the modern state of Turkey, and lasted from 1293 to 1923. At its height in the 16th and 17th centuries, the Ottoman Empire controlled territory on 3 continents. It controlled territory round the black sea, in the Balkan area of Europe, large swathes of Arabia, and along north Africa. All though its history, the Empire looked to expand its influence, with regular campaigns into Europe. The Empire reached as far as the gates of Vienna, and parts of Italy. Indeed, the Emperors took to effectively titling themselves as "The Roman Emperor" and saw themselves as legitimate successors to the previous Roman Empire. This saw a concerted campaign to seize the heart of the old Roman Empire, the city of Rome. Whilst they managed to briefly hold parts of Italy, they never where able to get the city of Rome. The Ottoman Empire did not have a fixed flag, with Emperors using a variety of flags for the state, and as personal banners. 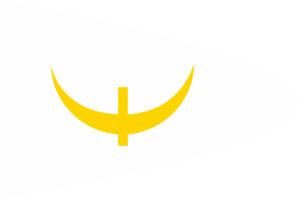 One of the earliest in use to represent the Ottoman Empire, was a simple white banner with a gold crescent faced up, with a single bar running through it. This emblem was called the Kayi Tamgha, "seal." This banner was in use from very old times, to 1326. From 1383 to 1453, a new banner was used for the Empire. 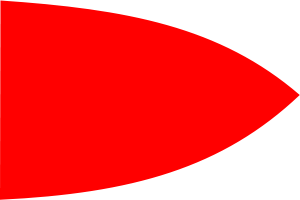 A simple red curved triangular pennant. From 1326, to 1517, the Emperor flew a new flag alongside this pennant. 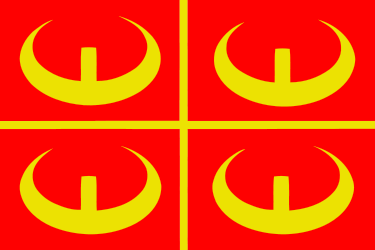 A red banner, with a gold cross. 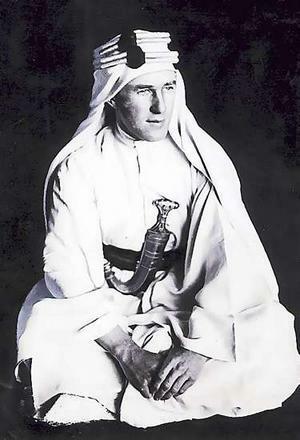 In each canton, he placed a stylised version of the Kayi Tamgha. After 1453, the Emperor introduced a modified pennant. Keeping the shape and colour previously, but placing a single gold crescent upon it.This banner was in use up to 1844. 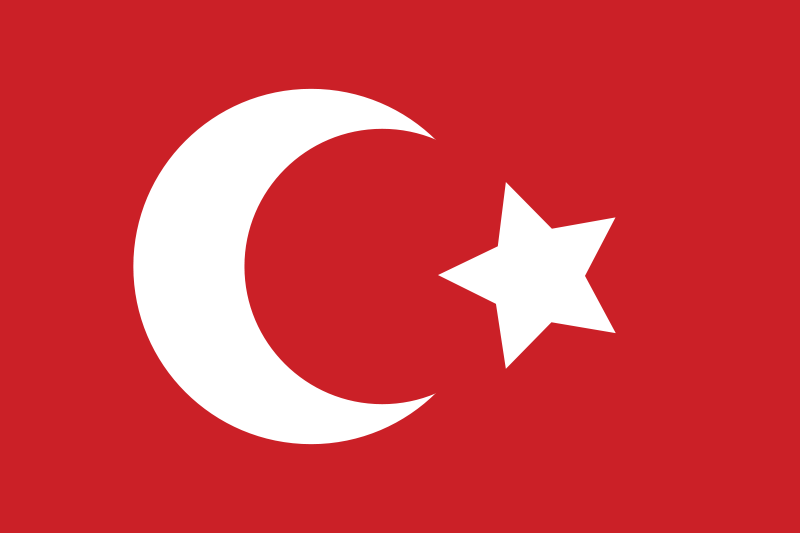 The Ottoman Navy used its own version of this pennant, but switching the red for green. This was in use to 1793. Another banner introduced for the Empire came in in 1517, and was in use until 1844. 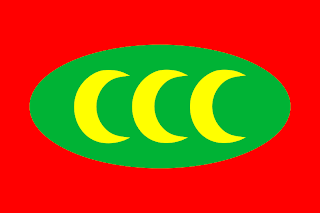 This new banner was a standard rectangular red banner, with a green oval in the centre. In the centre of the oval, they placed three gold crescents. In 1843, The Ottoman Empire tried to arrest the slow decline of its Empire by instituting a massive program of reform. The Tanzimat. This saw the secularisation of the state from Islam. Something the modern Turkey has tried to maintain. This program sought to bring all its citizens together as Ottoman by guaranteeing all its citizens equal rights. Something that had not happened before, with non-Muslims being treated as second-class. In order to unify the people of its empire, part of the reform saw the introduction of a new flag. This time, a simple red banner, on which is a white crescent, and a 5 point star. This was the last flag of the Empire, and in use from 1844 to 1923. The First World War triggered the ultimate demise for the Ottoman Empire. Before the war, the Empire ended up losing a lot of its European territories in the Balkans after campaigns by the people there for freedom. At the start of the First World War, the Ottoman Empire enjoyed a sequences of success. However, Pressure in Europe, and an Arabic uprising led by Captain T.E Lawrence (Lawrence of Arabia), and backed by the British, proved most successful in pushing Ottoman forces away from the Arabian peninsula. With the ending of the war, the Ottoman Empire was on the losing side. Its territories where divided up, and gained their freedom. After the war, Britain and France occupied the city of Istanbul in order to force the implementation of a peace treaty, and make sure that the partition of the territories went ahead unimpaired. The occupation led to the rise of a nationalist movement that fought to get the "occupiers" out of Turkey. The end result of this saw the abolition of the Ottoman Empire, the abdication of the Emperor, and the creation of a new, secular, republican Turkey. Ever since then, Turkey has had a staunchly secular constitution, whilst the majority of the people are Muslim. This secular society is fiercely guarded by the military and judiciary. And currently sees a lot of pressure rising, with the current Turkish government being accused of pursuing an Islamic agenda. 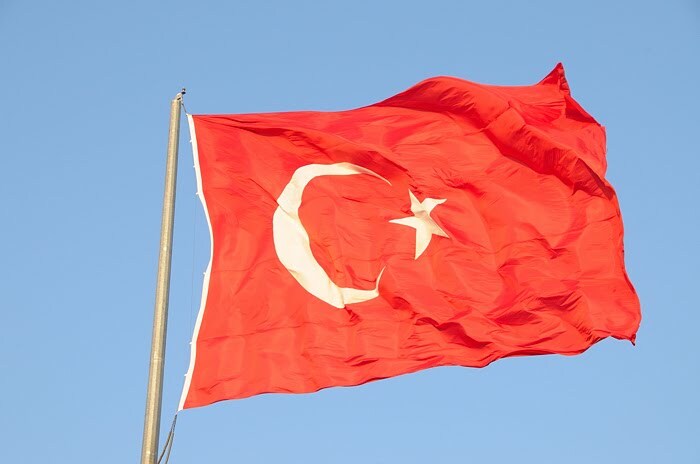 With the foundation of a new Turkish state, a new flag was brought in. It was decided to keep the last flag of the Ottoman Empire. However, the new flag saw a slightly lighter shade of red used, as well as having the crescent and star being slimmed, as well as having regulations laid down detailing the dimensions of the flag and its component parts. The crescent was first used as a symbol of the Ottoman Empire as far back as 339 BC, when a waxing moon allowed the people of Byzantium to beat off an attack by Phillip of Macedon. The people where so grateful, they brought in the crescent as a symbol. The use of the crescent and star has cropped up many times through Turkey's history. Mainly, just when defeat looks likely for the Turks, the Emperor has seen an image of a star and a crescent in a pool of blood. The leader of Turkey is then able to lead his forces to victory!